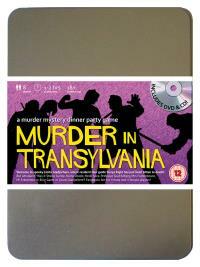 You've been invited to play the role of MR FRANKNBEANZ in Murder in Transylvania. Who killed Sonya Right? Welcome to Castle Gladjorhere, home of the world’s one and only Transvampire with a soul! Visitors from all walks of life have come to witness the thrills and chills of this genuine Transylvanian house of horror, all of which will be revealed by the resident tour guide Sonya Right. But shortly after dinner Sonya is found in her room with two small puncture wounds in her neck. Join us to find out who sucked the life out of her! The Count’s chef (don’t ask for his secret ingredients!) Costume Suggestion : Your classic Neanderthal forehead peeks cheekily from underneath your chef’s hat and you sport a large white apron spattered with blood. Coupled with the bolts through the neck, you’re not the first person people want to meet in a dark alleyway. For the last two years you’ve been working as Head Chef at Castle Gladjorhere. Staying in the kitchen suits you enormously as, when you go out, your appearance tends to scare people. Fifteen years ago, there was a terrible accident where you worked and most of the kitchen staff were killed, but you turned it to your advantage by creating Mrs Franknbeanz out of their charred body parts.